See how your visitors are interacting with your content. What is Event & Conversion Tracking? Aside from tracking basic metrics like pageviews and bounce rates, Google Analytics can also help you track more advanced statistics like conversions. By setting up events and goals, Google Analytics can let you know how many visitors have interacted with a button or webform on your page. This allows you to see which of your landing pages is converting the most customers and allows you to do conversion optimization with A/B testing. Event tracking tells Google Analytics which of your page elements were clicked and is an essential tool for tracking how your call to action buttons and lead generation forms are performing. Our site builder makes it very easy to set up event tracking. In the site builder, click the button or webform that you want to track. A menu should pop up. Choose Google Event Tracking. Turn on Track This Element. 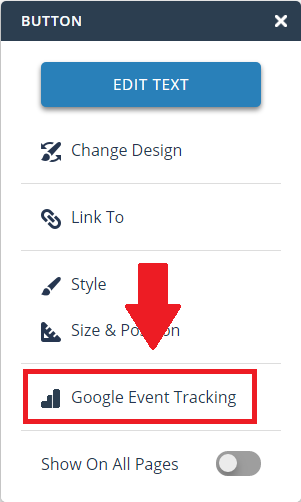 You should see four settings relating to how events will be tracked and categorized in Google Analytics. This is a name that you can give as a way to group the elements that you want to track. You can put in whatever you want since it's just for your reference only. 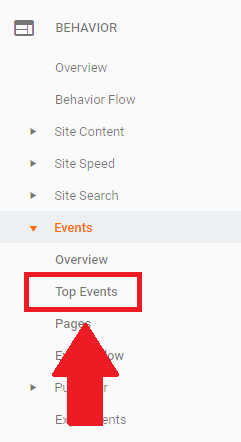 For example, if you're tracking multiple elements and you set their event categories all to "button", they will be grouped together under the category "button" in the Google Analytics Events Report. This is a name that you can use to identify the type of action that you're trying to track. Similar to categories, what you put in is up to you. This allows you to view the statistics for these buttons separately in the events report, rather than having all the stats combined under "Button > Click". You can set a value if the event has a monetary value attached to it. For example, if you think each submission for your lead generation form is worth $3, you can set "3" as the value for your form. This feature is used for reporting purposes only and is entirely optional. Once you're done with your changes, you will need to Publish your website to make your changes go live. You can set goals to let Google Analytics know what to count as a conversion. These conversion numbers will show up on various reports throughout Google Analytics. In addition, you'll need to set up goals first before you can do A/B testing. Log into Google Analytics and choose the website you want to view. Click Admin at the bottom-left. Under the View column, click Goals. Goal Description - This is where you specify what to track as a conversion. You can give this goal a name for your reference. 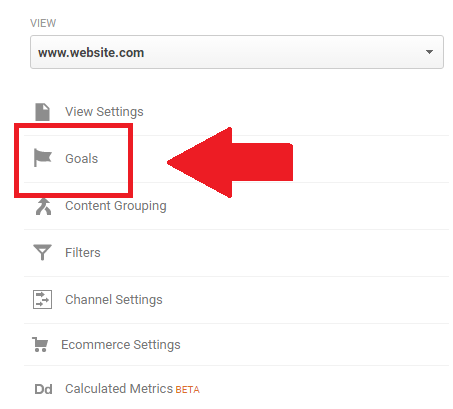 Google Analytics lets you set up to 20 goals and the Goal Slot ID is just to indicate which number this goal will be assigned to. 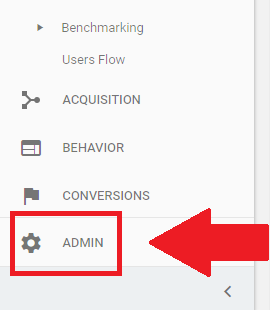 You can just leave this on the default setting since Google Analytics will increment this automatically. This is where you tell Google Analytics what you want to track. Destination and Event are the most useful things to set as conversions. Choosing Destination tells Google to count each pageview for a specific page as a conversion. This is useful if you have a multiple step signup process. Choosing Event tells Google to count the event you specify as a conversion. This is useful if you have a one-step conversion process -- like click a button or submitting a form. Once you're done, click Continue. Goal Details - What's needed here will be different depending on which Type you've chosen in the previous step. If you chose Destination, you will need to put in the web address (URL) of the page that you wish to use to track conversions with. This means that whenever someone views this page, it will count as a conversion in Google Analytics. If you chose Event, you will need to put in the category, action, or label of the events you wish to count as conversions. 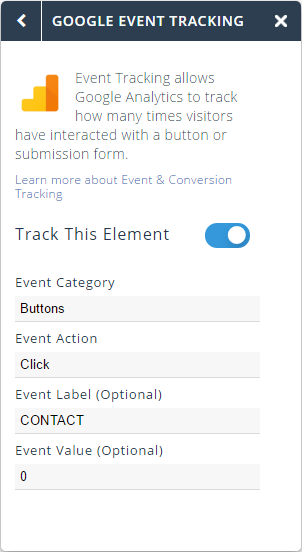 You can put in just the event category if you want to count all button clicks or form submissions for a particular category as conversions. This is useful if you have multiple call to action buttons and you don't care which one gets clicked. Alternatively, you can fill in the category, action, and label fields if you're looking to count clicks for a specific button as conversions. In the menu to the left, click Behavior, then Events, and finally Top Events. This will show all the event categories that you've setup. You can click on each one to drill down to view the action types that are associated with those categories, and you can click on each action type to drill down to view events according to their label. Total Events indicates how many times the event has occurred, while Unique Events indicates how many unique visitors triggered the event. The goals that you set will show up on various reports like demographics, geo, and referrals, just to name a few. These reports will tell you how different genders, age groups, locales, referral sources, etc contributed to your conversions. Are you getting a lot of traffic from a particular age group, but they're not converting? If so, then maybe you will need to tailor your products and services more for that age group. You can use your conversion data to adjust your marketing strategy. Is one of your landing pages getting a lot of traffic, but very few conversions? If so, then maybe you can enhance that page and see if you can get more conversions. Over time, you can use this conversion data to optimize conversion rates for your website and business.